It’s been 50 years since the Oakland Athletics moved to the Oakland-Alameda County Coliseum, and the A’s are celebrating the occasion with a free game tomorrow and other festivities. The Oakland-Alameda County Coliseum was already an established facility when Charlie O. Finley moved his Kansas City Athletics to Oakland for the 1968 season. Public discussions on a new stadium in Oakland had begun as far back as the late 1950s, as East Bay leaders wanted to make a mark via professional sports, while obviously competing with San Francisco for attention. San Francisco had already lured the New York Giants and were in the process of landing the relocating Philadelphia Warriors for the 1962-1963 NBA season, while the San Francisco 49ers had been playing out of Kezar Stadium since 1946. San Francisco was a big-league city; Oakland was not. To compete, Bay Area leaders envisioned a sports complex featuring a multiuse stadium and an arena connected by an exhibition hall. After tossing about a few potential locations—including one near Lake Merritt and downtown Oakland—the leaders settled on the current Nimitz Freeway site. 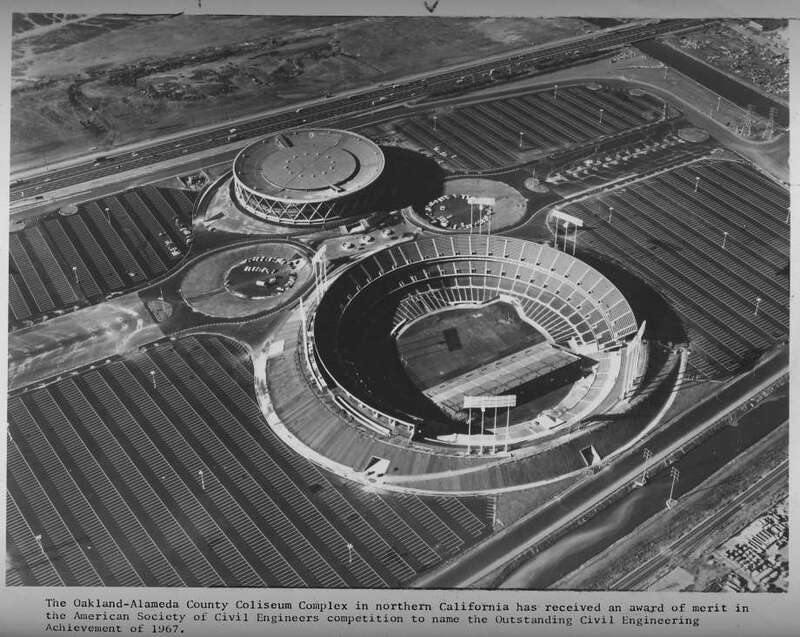 Construction on the Oakland-Alameda County Coliseum began in April 1964. The opening date of Sept. 18, 1966 featured the NFL’s Oakland Raiders as the Coliseum’s main tenant. Still, East Bay officials sought an MLB tenant and had in fact been in communications with American League officials regarding a relocation. The Cleveland Indians and Chicago White Sox were among the teams rumored to be looking at a move, but the most active owner on the relocation front was Finley, who had worn out his welcome in Kansas City after buying the Athletics from Arnold Johnson’s estate. Finley, a self-made millionaire who made his money in the insurance industry, came into Kansas City with plenty of great ideas and marketing pizzazz (A mule for a mascot! A rabbit delivering balls to the umpire! Sheep grazing on the right-field berm! A Pennant Porch in flagrant disregard of MLB ballpark rules! Pink neon foul poles! Yellow baseballs! ), but in the end he soured on Kansas City after local business leaders soured on him. Though there were plans for a new Kansas City ballpark to replace Municipal Stadium after Jackson County voters in June 1967 approved $102 million bonds to build what would become the Truman Sports Complex, it was clear to Finley that he’d never own the team playing there. And so, after exploring moves over the years to locales like Dallas-Fort Worth, Milwaukee, Atlanta, Seattle and Louisville (where he actually signed a lease in 1964), Finley finally received permission to move to Oakland following the 1967 season. On April 17, 1968, the Baltimore Orioles defeated the Oakland Athletics, 4-1, before 50,164 fans at the Oakland-Alameda County Coliseum. Dave McNally threw a complete-game two-hitter for the win; Lew Krausse gave up all four runs in 5.1 innings of work and took the loss. California Gov. Ronald Reagan threw out the ceremonial first pitch. Lew Krausse, signed as a bonus baby by Finley in 1961 and who eventually started the April 17 debut for the A’s in 1968, will throw out the first pitch at the anniversary game. The A’s and opponent Chicago White Sox will be wearing replica 1968 jerseys. Tickets for the free game have already been distributed, but there are plenty available on the aftermarket at very low prices.